30 Sep 2017	Exceptional care and dedication demonstrated by the entire hospital staff. Thank you so much. Kenya 30 Sep 2017	Everything was good to our satisfaction perfectly ok. Please continue with the good work. Kenya 30 Sep 2017	I was very happy with MIOT overall and my prayers with you always. Recently, I was admitted to your Hospital from 21st. Aug to 30th.Aug, 2017 for recurrent UTI. I received excellent treatment, recovered and have since returned back to Bhopal. Since past 15 years, after my Kidney Transplant in 2002, I have been under the treatment and care of Dr. Ravichandran and have been doing well. Past few years, I visited MIOT as an out-patient and always appreciated the Management of this Hospital both in terms of the excellence in treatment of Dr. Ravichandran, patient friendliness and effective systems and procedures and many other aspects…. and came back happy. This year, just before my check-up I suddenly developed intense UTI which aggravated leaps and bounds and I was caught unaware . I could hardly walk few steps. However with great difficulty I could board the flights and came to MIOT. Great attention was paid immediately to diagnose/know the genesis of my problems. A line of treatment was put in place and in about ten days time got a comfortable recovery. This period was a great ‘experience’; being able to see Hospital operation as a whole, various aspects of its management , the patient care and every other thing. The cleanliness, the security, team behaviour of various levels of staff etc. is worth noticing; same were the view all who visited us. The Hospital layout, wide walkways, interconnectivity of buildings, low decibel atmosphere, alertness regarding the pathological measurements and other staff catches one’s attention without fail. No gossiping..no hospital smell. One does feel this place surely differentiates as related to others. The ward where I stayed was airy and ‘patient friendly’. One doesn’t feel like a typical Hospital corridor…. more like a small group home. Group dynamics of nurses/sisters are quite supportive. Down the line the cleaning squad, in general, is dutiful and does not require a reminder regarding their responsibilities. The are very warm as well. Duty doctors were attentive and organised. The PR team is extremely helpful and the check-in and check-out activities are very well done so that patient does not have to worry much. A word for the food supply… their timeliness, quality of cooking courtesy is praiseworthy. I strongly feel such a set up with Excellence and Continuity cannot just happen unless a keen eye has a passion for all facets and minute details offering best possible treatment and service and with consistency. This is where the management under your leadership is doing a great job in offering high quality services to the patients. As regards, the treatment is concerned, besides the Excellent Competence/Holistic approach of Dr. Ravichandran, the timeliness of the visit, focus while examining a patient, gauging them, the speed of the decision making, time management and conviction is simply exceptional. Other aspect which attracted my attention i.e. the warmth to patient is never forgotten in the process. It’s not me alone. I got at an impression from other patients also. Most feel that once they come to MIOT and submit to Dr. Ravichandran, best is bound to come. The patients then remain quite relaxed and happy which is a great input to recovery process. Besides, such a culture once get penetrating at all levels … makes a Hospital great one and the words go round which is happening at MIOT. 11 Sep 2017	My heartfelt thanks to all staffs of MIOT hospitals. Thinking about MIOT hospitals “that means it’s a great organisation having an expertise doctors, nursing staff & also having administration staff”. It’s a miracle & still I can’t imagine that within 10 days my mom operation was successfully done by doctors. Fiji 08 Sep 2017	I am writing to express my heartfelt gratitude for the care and treatment I received at your hands. I went with a hope for my hip replacement but to my surprise was diagnosed heart disease, which I did not know. Presently I am on medication and waiting for my review in October. 95% blockage is significantly high and hope something would be done so that I can move on with my life. Your diagnosis has given my life a new beginning. At MOIT it is not just treatment, but the care and empathy from heart shown by Doctors like you which brings smile on patient’s face. I wish to express my sincere appreciation to the wonderful and dedicated Doctors, Nurses and Staff at MOIT during my short stay there. We do not have enough positive words to describe how great the professionals, support team and facilities are at MIOT International. We have been truly blessed to experience and be cured by your vision and passion for loving care and service that MIOT stands for and is being defined by. 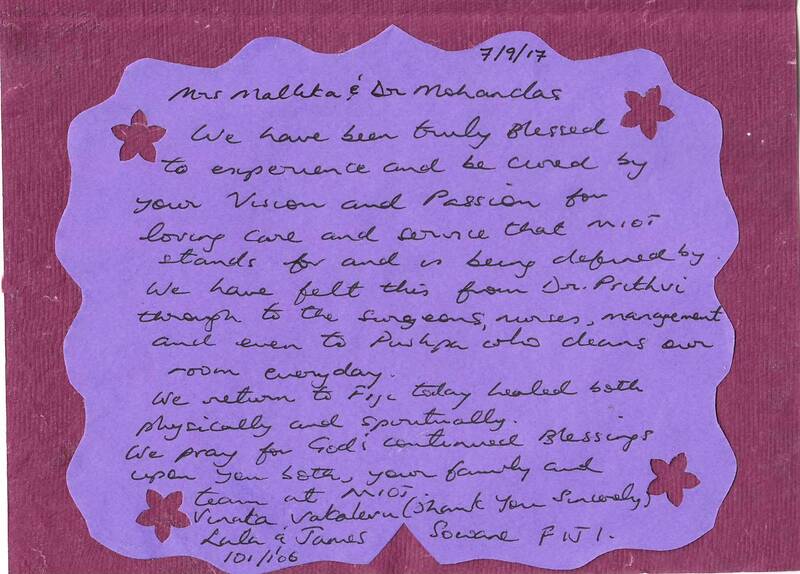 We have felt this from Dr. Prithvi through to the surgeons, nurses, management and even to Pushpa who cleans our room every day. We return to Fiji today healed both physically and spiritually. We pray for God’s continued blessings upon you both, your family and team at MIOT.